Today was one of those hot, muggy summer days where just walking around makes you sweat. Horses mostly hung out swishing flies, cats hid in the cooler recesses of the big barn, and Marley the tour dog walked sedately alongside us instead of running ahead. Carrots were a welcome diversion from fly-swishing, as were people willing to take on some fly-swishing duties. Even Afternoon Deelites came over, something he hasn’t done on one of my tours since the infamous grazing muzzle showed up. Probably the most enjoyable part of giving tours is sharing the different personalities of our horses. We were busy and had quite a few kids visit today, all of whom really had fun with the horses. I never get tired of watching how gentle the big stallions are with kids. Tiny fingers are safe from teeth, no matter that grown -up fingers may not be. Danthebluegrassman is a perfect example of that, but even Gulch and Creator are far more gentle taking carrots from kids than from adults. Clever, Marquetry and Sunshine are all great with kids, too. But our best kid horse right now just might be Patton. This morning, six kids lined up on the fence to scratch his back. Hard to say who had more fun, but as you can see from the photo, it was a happy group. The little guy in the orange shirt wrapped his arm around Patton’s neck and gave him kisses. That horse was in heaven, let me tell you. He enjoyed the attention so much he didn’t care a bit if he got carrots or not. Our newest horse, as you know, is six year old Rapid Redux. After little more than a week, R2 has figured out the carrot bucket. More impressively, he has figured out how to meet us both coming and going—he isn’t missing a chance for carrots. He seems great with people too, happy to be fussed over, and patted. He was perfectly ok with kids climbing on the fence to pat him, and accepted kisses from anyone offering. He is a really pretty horse– a deep chestnut color with a mane and tail just a shade darker. I’m pretty sure he thinks he fell into high cotton at Old Friends. The other “new” horse I really like is Arson Squad, although Arson has actually been with us for 5 or 6 months now. Arson isn’t on tours and won’t be for some time, as he is recovering from that injured leg and subsequent surgery. He isn’t ready to learn the meaning of the carrot bucket, yet. But he is such a pretty little horse. Today, as we walked past the small barn where he resides, he watched us from his window, probably wondering what all those little people were about. At one point today, Special Ring was doing his tattoo trick and Pops finally had enough of the showing off. Pops bared his teeth and took a big bite at Ring, I guess telling him to knock it off. Not that it stopped Ring, he just moved a few feet out of teeth range and went right back to showing off. Pops hated it—that competition thing rears its head! Someone in every group commented on yesterday’s Belmont Stakes, whether to ask about I’ll Have Another or Union Rags. Sadly, we’ll go another year without a Triple Crown winner. I’m glad I’ll Have Another didn’t run on a wonky tendon, and Union Rags was a classy winner. There has been a great deal of scrutiny of horse racing–on TV, in the print media, online—so much that it might be hard for the casual fan to understand what it is about racing that creates such passion for some of us. But really, it’s all about the horses. They all have so much personality: some of them are kind and gentle; others are monarchs who demand worship. And yes, Thoroughbreds love to run. We see them run in their paddocks all the time, just because they can. Today we saw Dan and Flick race to the fence to see who would get to the tour, and carrots, first. The best racehorses are highly competitive. Whether it’s running faster than the horse in the neighboring paddock, or demanding more carrots than their neighbor, the competitive streak runs deep. So while I am disappointed there was no Triple Crown this year, there is always next year. And in the meantime, we have our boys (and girls) at the farm to visit with. We hope you can visit us soon, but in the meantime, thanks for spending this Sunday with Old Friends! Summer has arrived, and along with summer comes the corresponding summertime issues: hot sun and flies! We had a warm winter, as many people did, and I think one of the results of that will be an especially “buzzy” fly season! Fly masks are on, at least on the horses who will wear one. For the others, well, nature has her own ways of helping horses cope—long forelocks, manes and tails! As you probably know, we lost one of our long-time residents a couple weeks ago. Leave Seattle was special to a lot of people at the farm. Despite being a son of Seattle Slew, he didn’t have much of a racing career or a particularly successful stallion career. On the other hand, once he got to Old Friends, he sort of found his niche. He was often a little cranky but rarely missed a carrot opportunity, even if he made you feel that he was barely tolerating your human presence. He didn’t much care to be fussed over but if he liked someone, they might be allowed to pat his nose. He was kind of small and didn’t really stick out in a crowd, but was still a really pretty horse. Throughout his time at Old Friends, he never made a fuss or caused a commotion. Green grass, some carrots and regular mealtimes were all he really expected out of life. In the end, Leave Seattle developed a neurological issue that came on suddenly and worsened rapidly. It happened so fast that he never had a chance to suffer, and at Old Friends we try not to let our old boys and girls suffer when the time comes. Leave Seattle enjoyed his life up until the very end, and then he went peacefully on. You can’t ask for more than that, really. Rapid Redux holds the modern day racing record for consecutive wins. He was retired with winnings of over $350,000 and a record 22 straight wins. A six year old son of Pleasantly Perfect, you can see R2’s pedigree here. R2 is living in the paddock behind the office, Swannie having moved into Leave Seattle’s old paddock next to Pops and Ring. R2 is a very pretty bright chestnut with a narrow white stripe down his face. Today I could tell is wasn’t totally tuned in to the carrot bucket, but when he did come over he was very, very nice. He took carrots like a gentleman, let little girls fuss over him and generally seemed to be a calm, easy-going horse. He will love being at Old Friends. We had some terrific visitors today, as is usually the case, but one little girl stood out. She was probably 6 or 7, and is a professional actress filming a movie in Lexington. Rachel is also going to be on a new ABC series in January called “How To Live with Your Parents.” She was a terrific kid: polite, friendly and talkative. 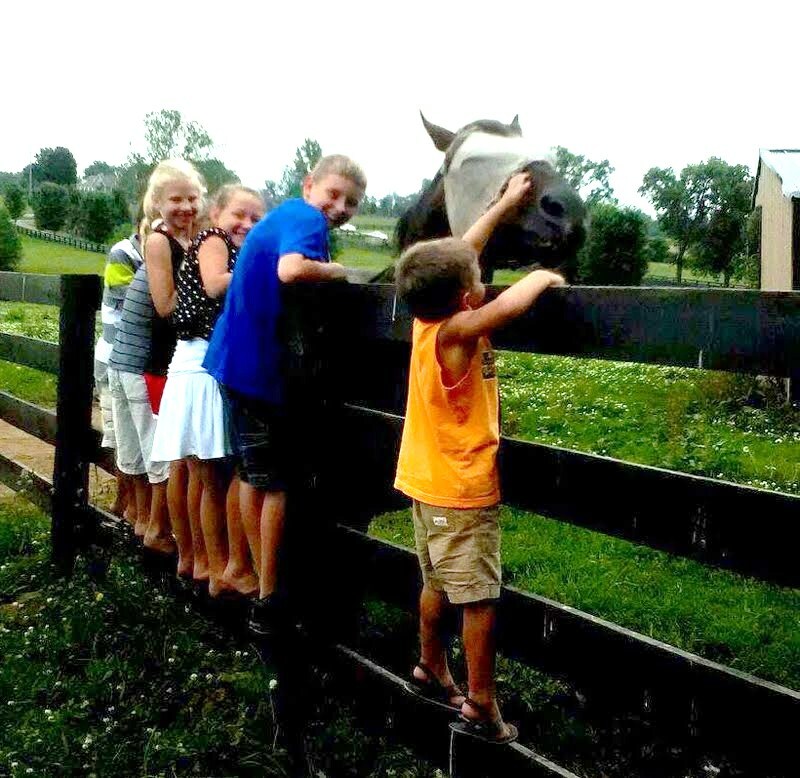 She also loved the horses, climbing on the fence to greet each one. Of course, she liked Pops best, as they had the whole movie star/acting thing in common. Patton was pretty smitten with her, too, offering up kisses and slobbery affection. And now, I can say I know a Hollywood actress! Afternoon Deelites is still wearing his grazing muzzle, and is still sulking. In fact, he is so miffed about the whole situation that he refused to even look at us today. And just forget about coming over to visit, not happening. On the other hand, Kiri’s Clown also wears the grazing muzzle but he takes the opposite approach. He met us at the fence every time, hoping we would have pity on him and take the darn contraption off. No such luck, but Kiri keeps hoping! Compare AD and Kiri, who are on summer diets because extra weight affects their legs and feet, with Commentator and Patton. Tator and Patton clearly have no difficulty carrying a few, ahem, extra pounds. I can only describe Tator like this: picture a fat sausage. Now add four toothpicks for legs. Voila, that’s our Tator! OK, OK, so it’s not really that bad. But he is, let’s say, a well-rounded individual! And Patton is much the same, although Patton has kind of that quarter horse physique anyway—square bodied, stocky and solidly muscled. Oh, and Special Ring is right up there in the running for most well-fed, too! It was a fun day at the farm today. I visited with Wallenda, gave three tours, got slobbered on, met the new horse. It makes for a quick but enjoyable Sunday. We hope you can visit us soon, but in the meantime thanks for spending this Sunday with Old Friends! P.S. To I’ll Have Another: run like the wind, big boy!